Once again Caleb, the son of my fellow blogger Cristal, has wisdom beyond his years that every adult should pay attention to. As we were leaving the Chimpanzee movie last week, I expressed to Caleb my frustration with the bad guys (or evil chimps) in the movie. Then, using his gift of goodness, he gently corrected his mother. You’re only seeing what the producer of the movie wanted you to see and the way he wanted you to see it. Allowing the truth to soak in briefly, Caleb explained. Scar and his guys were hungry, too. But, the movie didn’t show us that part. I’d only looked at the surface of what the film had provided. Just days before we boarded a plane for South Sudan, another fight broke out along the boarder between Sudan and South Sudan. Three days and five flights later we arrived in Malakal, a boarder town that just a few months ago witnessed two days of street fighting between rebel infiltrators from the north and South Sudanese militia. It was just one more of countless such battles that have taken place during the decades long civil war that ended with independence for South Sudan in July of 2011. The war, which claimed more that 2 million lives, has officially ended, but the fighting has not. In fact Sudanese President Bashir has recently declared that he intends to retake South Sudan and incorporate it back into Sudan. I have no doubt that the South Sudanese will resist that prospect with all they have. The latest round of fighting was set off when Sudanese planes bombed a town in South Sudan. The south retaliated and actually captured Heglig, a town in Sudan’s oil fields. Since then the sabers have been rattling overtime. 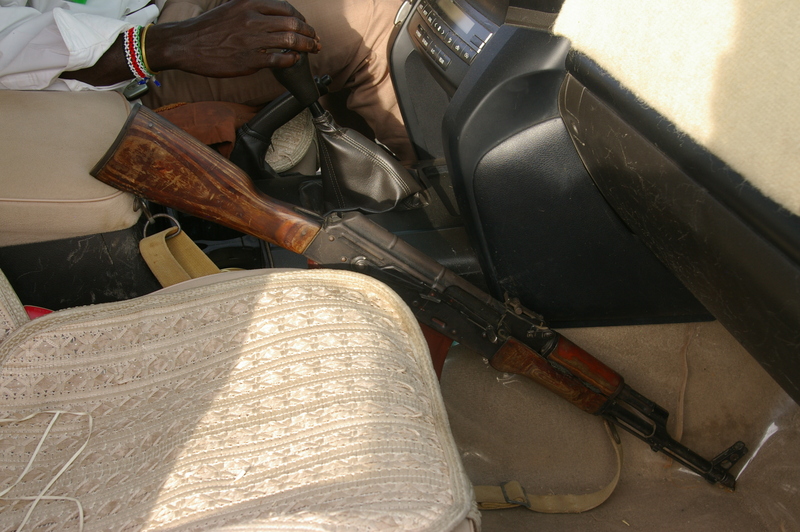 Security in Malakal is a constant concern as I learned when I opened the door of the SUV we were to ride in and found that I was literally riding shotgun. An AK-47 was placed between my seat that the middle arm rest. A bullet hole was in the windshield in front of me at forehead level. Riding shotgun, well actually riding "AK-47"
The root of the problem in Sudan and South Sudan is that Bashir has declared that Islamic Sharia law is to be imposed on all Sudan. He originally was content to let the Christian south secede so that he had little or no interference with his plan. It seems he hoped to also drive out Christians from Sudan and force them to move to South Sudan. Yet, hundreds of thousands of Christians remained in the north and continued to live out their Christian faith and witness. Despite threats, loss of jobs, destruction of homes, and numerous other hardships, they remain. Not only do they remain, but their service and love of their Muslim neighbors has resulted in continual conversions from Islam to Jesus. So Bashir’s latest statement is that the conflict will end either in Jubba, the capitol of South Sudan or in Khartoum, the capitol of Sudan. His meaning is clear. One country or the other will have to conquer and impose it’s will militarily. For three days in Malakal, Pastor Gus Davies, John Tardonia, Alan Carpenter, and I had the blessed honor of working with some of the most courageous and gracious people I have ever met. I have been to numerous countries over the last several years and encountered people in all sorts of situations. Never have a met a group of people who have endured so much, for so long, with such grace, courage, and even joy. The pastors and leaders that we are working with in Sudan and South Sudan have known nothing but war for their entire lives. They all know people, including family members, who are among the 2 million dead. Yet, they see nothing but opportunities to love their neighbors and their enemies. Often those two groups, neighbor and enemy, are one and the same. It seems that they view this fact as being convenient. Instead of needing to love a neighbor and an enemy, they get to love both in one person, half the effort. Not only is the war part of daily life, but so is poverty, sickness, and deprivations that we in the west would find shocking. Consider two numbers. First, 95% of South Sudanese will never finish primary school, or what we in American call elementary school. Second, 50 out of every 1,000 women giving birth will die doing so. One person told us, “If you are sick and go to the hospital you will die. If you are healthy and go to the hospital, you will get sick and then you will die”. Yet as these wonderful people speak of the hardships in their lives they do so with a smile as they talk about all the doors such hardship opens for sharing the Gospel and loving the needy. They don’t seem to knotice that they are among the needy. 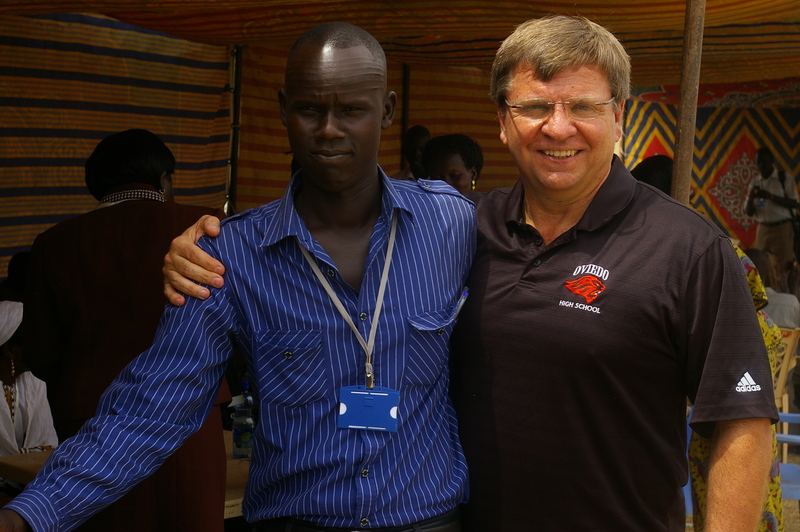 One of many South Sudanese pastors who inspired me with his joy. At Northland Church we talk about the Church Distributed. By that we mean, every follower of Christ takes the church with them, everywhere, everyday, and that a gathering of two or three people in Jesus name is the church gathered. You don’t need buildings to love and serve people for Jesus and you can start churches anywhere, in a home, a business, under a tree. In Malakal we completed the second level of Distributed Church training for 74 pastors and leaders. In the 5 months since they attended Level 1, nearly 1,000 people have come to faith in Christ because of their efforts, and churches are being started in homes and numerous other locations. Among the trainees were fourteen from Sudan. At the end of the training we gathering them together to pray for them as they were returning north to an uncertain future. There was no fear, anxiety, or consternation in any of them, only the anticipatory joy of heading back into the lions den in order to conquer the lion with the love of Christ. One of them told me of being threatened with his life on numerous occasions. With a laugh he told me that his response is always the same, “I say to them, if you kill me I just get to go and be with Jesus in heaven that much more quickly”. I know that he says it with all sincerity and with a joyous smile on his face. The response is always the same. They either walk away or get this puzzled look on their face which opens the door to talking about the Jesus he loves so deeply. During the time in Malakal we also met with the head of the Roman Catholic Diocese, the Anglian Bishop, the Moderator of the Presbyterian Church of Sudan and the Minister of Health for Upper Nile State. Each of them demonstrated the same courage, faith, and joy that had become so common in our time there. All four are desperate for us to work with them in changing the culture of South Sudan. From training their pastors, of the 475 Presbyterian pastors less that 40% are trained, to providing medical care and clean water, the doors are wide open for ministry that will glorify God and change lives. Since returning to Florida several people have asked if we were frightened to be there. The fighting going on was about 100 miles from Malakal. Pastor Gus and I have spoken often on this subject and the conclusion is always the same. When you know that God wants you to be someplace, then the safest place you can be is in that place. The most dangerous place you can be is someplace, anyplace, else. That doesn’t mean there is no danger. Things could go badly, quickly. But that is where one must trust that the Lord of the Universe, who called you to that place, has a better perspective than you do. 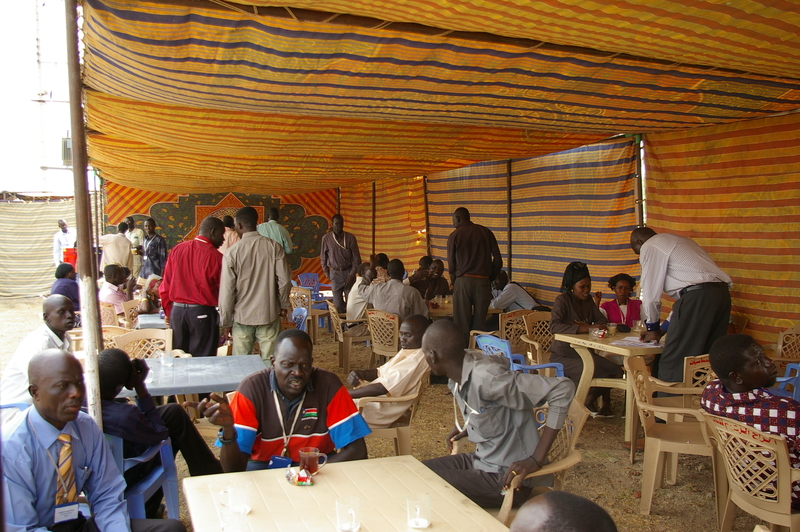 Additionally, the South Sudanese are not nameless, anonymous people. The pastors we trained are our brothers and sisters in Christ. They are family. Our being there, if only for a few days, was a huge encouragement to them. They were reminded that they were not alone, that Christians from as far away as Florida were standing with them in the furtherance of the Gospel and the changing of the world. How could we possibly stay home in our comfort, knowing that family needs us? Putting up with a few days of no running water, 100+ temperatures with no A/C, and bed bugs that made my hands look like I stuck them in a fire ant mound, was not even worth fretting over if it meant being able to witness the grace and courage of these amazing saints. Pray for them. Pray for Sudan and South Sudan. Pray that these pastors and leaders are able to change the culture and change their world. Pray that God will in deed supply all they need through the riches available in Christ Jesus our Lord. When you hear a news report or read a magazine article that mentions Sudan and South Sudan, don’t just gloss over it because it it over there, somewhere. Instead let that be the reminder that you too are connected with people there. Stop your reading if only for a moment and ask God to continue to bless them with grace and courage. While you are at it, ask Him to increase those things in your life too. I love this post from my friend Cristal. She has a very refreshing and challenging perspective on following Jesus. Once you read this post you will also see that she has an amazingly wise and provocative 12 year old son named Caleb who has a better perspective on Jesus, faith, and religion that most adults I know. This week, we are preparing our hearts for Easter Sunday using a Holy Week Worship Guide (thank you, Nick). Each year, thousands of faithful pilgrims made the trek to Jerusalem to celebrate the Passover, and Jesus and His disciples were among them. As I began to proceed, Caleb brought our voyage to a halt. His inquisitive mind craving the truth. Wouldn’t that have been religious of Jesus? We are hearing much about religion these days. Caleb explains he saw a man wearing a shirt which professed God hates religion but loves relationships. Then did God hate Jesus celebrating the Passover, mom? According to my 1949 Webster’s Dictionary, religion is the service and adoration of God as expressed in forms of worship.